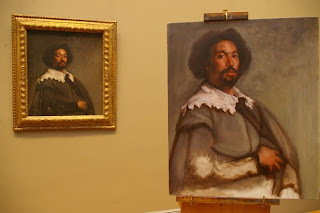 I recently had the opportunity to copy paintings at the Metropolitan Museum of Art in New York. After a bit of paperwork and a long wait, I was invited to copy the artist of my choice, mainly in the European Masters collection. The painting I chose was Velazquez's Juan de Pareja. One of his best portraits at the museum. It was an exciting opportunity. I have almost admired the work of Velazquez. Having spent so much time researching traditional materials, mixing my own paint, trying to decipher old techniques, I had a chance to work in front of the real thing. I entered the room, set up and got to work with a bit of trepidation. I wanted my copy to do justice to the real thing, in a way that I never felt working from reproductions. After awhile, I settled down, and realized that the work ahead would be just like painting a regular portrait. This is testament to the grounded realism of the painting. I would undergo the normal challenges of accurately representing shape and proportion. the final result is close, but not perfect. Museum rules dictated that I maintain a bit of distance between myself and the painting, so that museum goers could still view the painting. I could not close enough to view the intricate details of the painting. This was one big reason I signed up to copy in the first place. The result was a more holistic summary of what I saw. What was most interesting to me: the portrait when seen from reproductions shows a man with a blank expression. Standing in front of the real picture a subtle phantom smile appears. Having viewed at a lot of studios in recent months, I've been shocked by the often dismal quality of lighting. In particular, many modern studios ignore or waste the potential of natural light sources. Little work is necessary to harness natural light, and it is arguably the best studio light an artist can hope to have. The Old Masters lacked good sources of artificial light, so their studios were oriented around the goal of getting the best natural light possible. Their knowledge on the subject was well known and understood, up until fairly recently, when cheap electric lighting became practical. In most cases the best form of natural lighting is based on a simple northern exposure. What makes north light the best? In the northern hemisphere, it is the only light source in which there is never any direct sunlight. Light from other directions will vary considerably through the day, depending on the position of the sun, and the weather. North light remains consistent and predictable. The light that does enter through a north-facing window consists of reflected light, the majority of which comes from the sky. This light has been dispersed through the blue-colored molecules of air in the atmosphere, and trends toward the cool side of neutral. This kind of light is very useful for gauging accurate color. Artists are often frustrated at how different their work can look under different kinds of light. A painting done under the warm cast of a sunset for instance, might look disturbingly cold viewed under fluorescent lights. North light comes closest to a neutral source that achieves good color balance. Paintings done by an artist in the proper studio tend to translate well to other venues, such as galleries or museums.